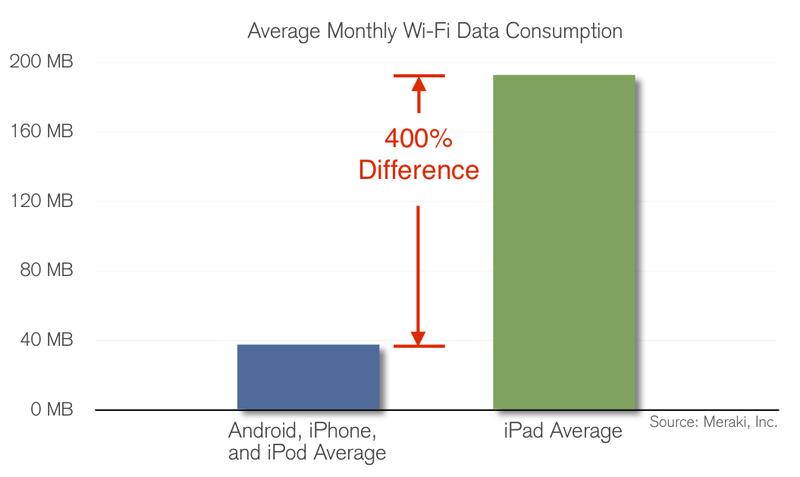 Study Shows That The iPad Consumes Most Data On Wi-Fi, More Than The iPhone, iPod touch And Android Combined! 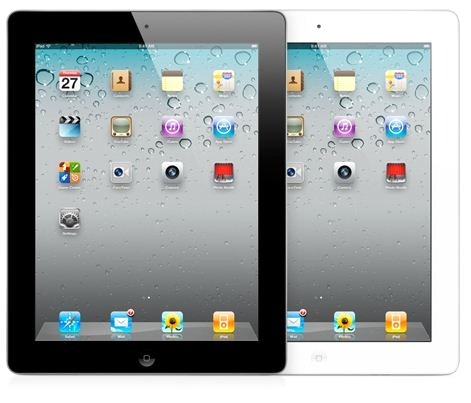 According to a study carried out by Meraki, a cloud solutions company, the iPad is now the device used to consume the most data, at least on Wi-Fi networks, which is about 4 times as much as the iPod touch, iPad and all Android devices combined. The company behind this study collected anonymous data from 100,000 randomly selected devices connected to public or educational WiFi networks in the US and compared its results against the data it had collected in 2010. Aside from consumption, Meraki has also looked at which devices were used the most and made some interesting discoveries. Traditional desktop operating systems, such as Windows and Mac OS X, is at an all-time low, declining by almost half, from 63% one year ago to 36% today. Meanwhile, iOS and Android combined now amount to about 58%, which has grown up further 33% when compared to last year. The biggest jump of all was Android, which went from a mere 1% one year ago to 11% this year. 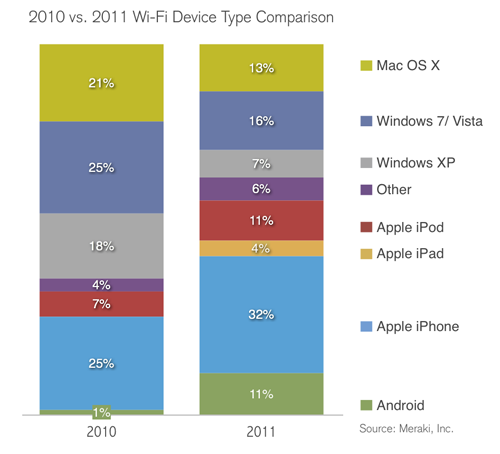 Despite the huge drop in Mac OS X usage, the iPhone is now the most popular WiFi device, at least according to the data gathered by this study, amounting to 32% of all devices, up from 25% last year, tied with Windows Vista and 7, which are now down to a mere 16%.